On 6th march Google released the new layout for Google Profiles with some great changes including larger cover photo, new tabs; review, About Me page with multi widgets layout, and feature to edit profile information with a quick edit in sub-window, etc. And today just after couple of months Google rolled out a more advanced Google Plus Profile Interface seems bit inspired from Facebook timeline,but have double column feed. 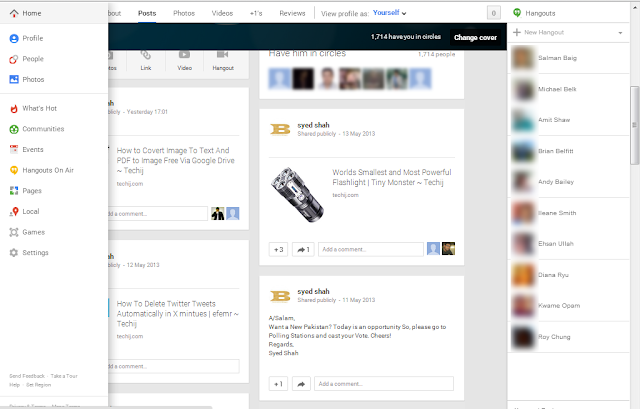 The new Google + Home is more simpler, have more beautiful interface, including photos, hangouts and a whole lot more. In new user interface users have a more beautiful stream with multi columns (1-3 columns depends on the size of screen). They also added a sticky navbar on top including Hangout Icon on right, notifications alert, tab links for Photos, Post, About sections. And on the left side a sidebar is hidden under the home icon which comes out on mouse hover action. Hidden left sidebar provides easy access to profile, manage photos, communities, pages, events, games, whats hot, setting etc.